I decided to make some progress on the raised garden beds. Once built with the hope of a juicy tomato dangling from the end of a dark green stalk, its weight heavy on the thin stem, it’s aroma rich with sweet ripeness…now only dry wrinkled shards of fruit remain on the desiccating brown skeletons propped up on rusty wire supports. 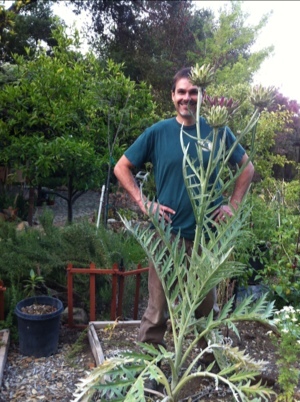 Tomato plants, artichokes in their second season, dried asparagus ferns…time to clean house. 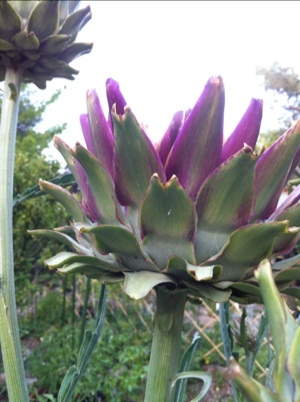 The artichokes. Here is a story on that one. I love to eat them…in a restaurant…with loads of garlic butter. I don’t care to cook them due to the time intensive effort & amount of waste generated. There are several plants actively growing in their second season right now. 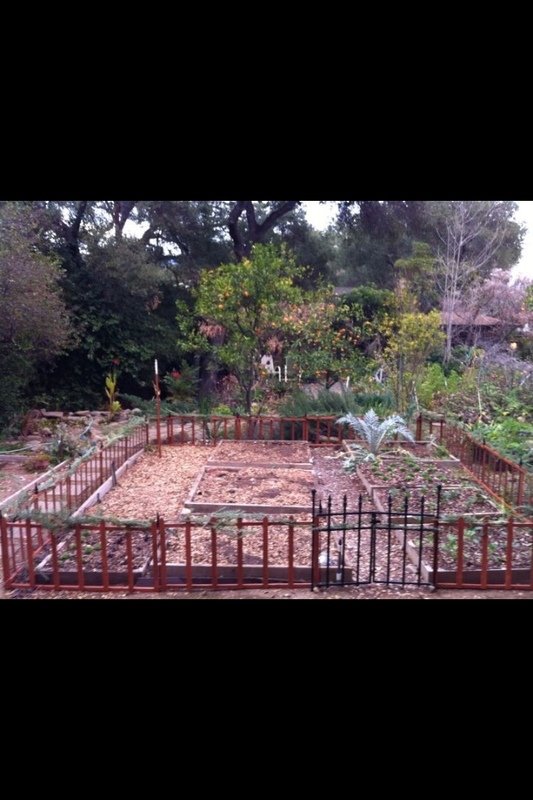 They are taking up valuable real estate in these raised beds and I would rather have tomatoes, peppers, garlic, basil…really anything else growing there. Paul is very intrigued by growing them and has asked that I leave one plant so that he “can experience the miracle of the plant growing it’s little artichokes and spike of flowers”. Like a dog who you don’t spay until after a litter of puppies. Sigh. 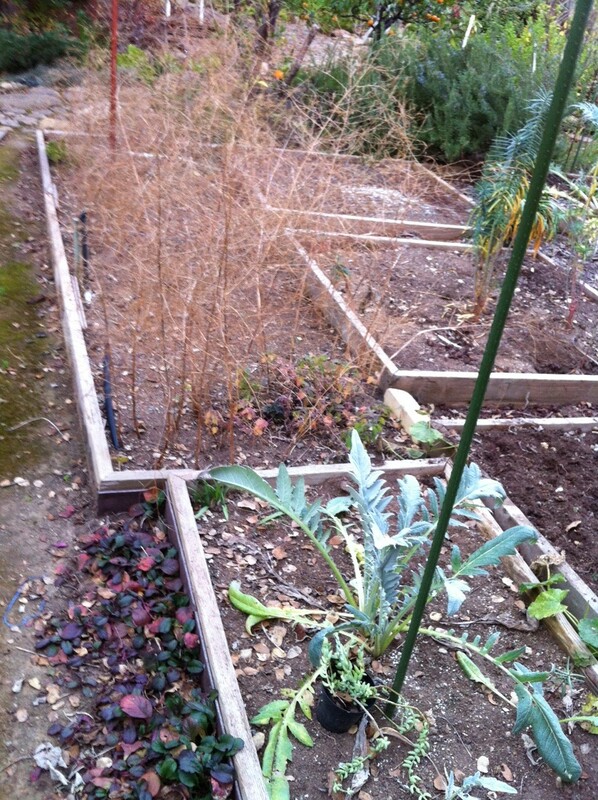 So the garden is all cleared out except for the token artichoke plant. 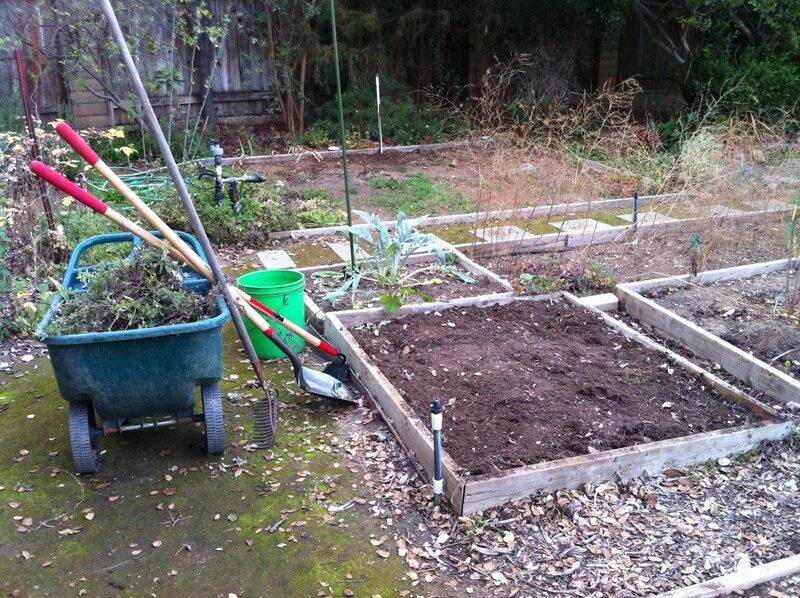 I pulled and cut everything out of here, took a hoe and shovel to each bed, then sifted compost onto each bed and raked in. 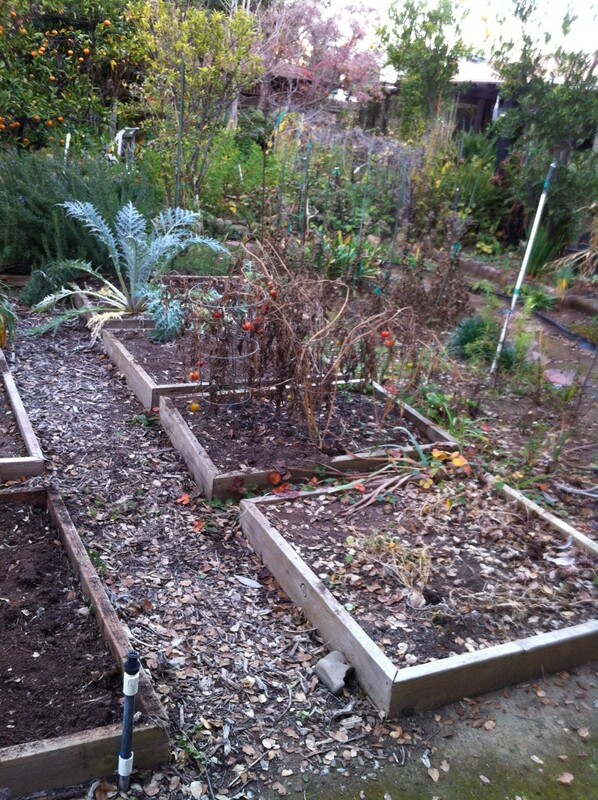 I ended the day by adding mulched leaves as cover. It was an awesome day. I have the smell of earth in my nose and the water ran dark off my skin in the shower. While I am doing this work I am wondering how I have come to know this stuff. I did it as a kid I guess, and I read and have picked up things at school…but it is a bit amazing to me tat I can just walk out and see what needs to be done and then know how to do it. How can something feel so far away yet so right and knowing at the same time? Fascinating. While hoeing I discovered more things that surprise me. Our buyers agent said “Surprises with houses are never a good thing.” I am only beginning to understand. 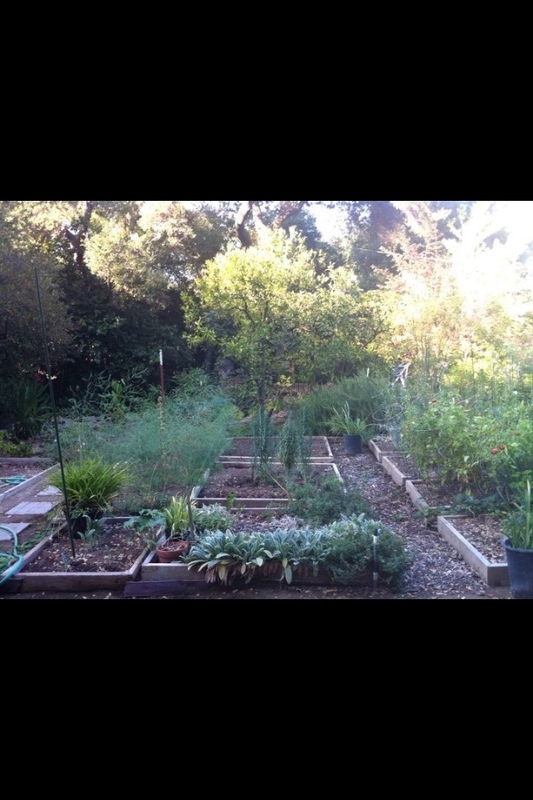 All the beds had chicken wire baskets with the tops submerged under the soil about 1 inch. So as you hoe, the edge grabbed the wire and stopped my hoe cold. I am sure the tomatoes were put into the ground that way, maybe she never heard of cloth or screen…it made it very hard to work with the soil and I had to dig and pull all of them out. They went quite deep so this project took longer than intended. I am sure the neighbors heard some choice words come out of my mouth. Another surprise was one of the boxes had a bunch of semi-digested white pellets lying on top of the soil. They had little flecks on them and I have no idea what they are. I might be completely fine with them or appalled, but without information they can not stay. Is is organic calcium or some toxic crap that she dumped on the soil? So weird. I removed the top layer that had these pellets on contact with the soil. Does anyone know what this was?